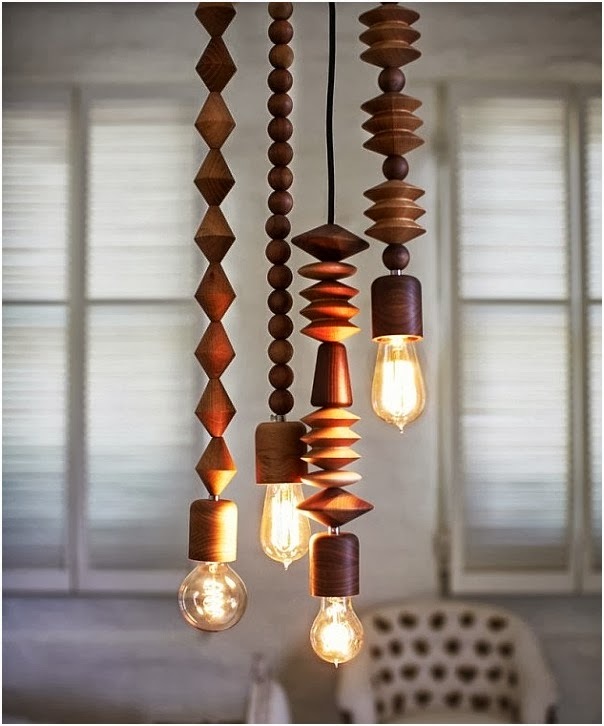 My latest obsession has been with beaded cord lights. I’ve been thinking about them to the point of distraction, and it’s clouded my ability to hunt for any sort of bedside reading lamp for F – you know the kind of reading lamp that is a.) basic, b.) inexpensive and c.) ready to plug in straight from the box. She got a bedside table from her grandparents for her birthday, and it’s about time she had some light at her bed. I think that ritual helped to form her later reading habits – she was an early reader, and now she’s an avid one. We’re a little late to this train for F.
Here’s the plan to catch up. Christmas. I don’t want to put a light on F’s bedside table – it’s a small surface, and I like the things that are on it now. The profile of the edge of the table would make it difficult (not impossible, but tricky) to attach a clip-on lamp. 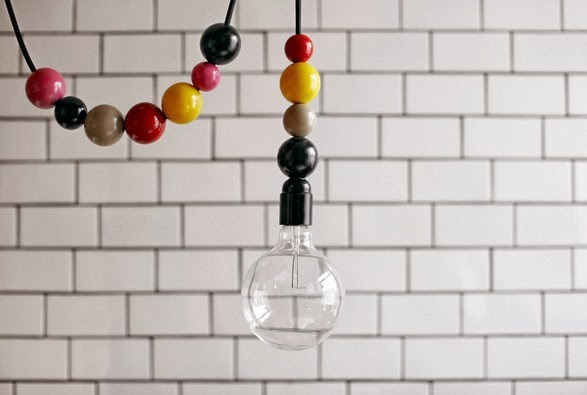 We could mount a swing arm lamp to the wall, but I’m still not completely inspired. So, M and I are going to make a lamp. We could go the route of purchasing a ready made cord kit, and then cut off the plug and the cord mounted switch, string the beads on, and then rewire the switch and plug. Not a hard task, we’re up for it. Something kind of like this. 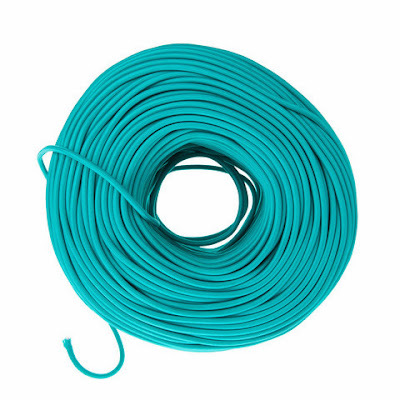 But then I found the Color Cord Company, where you can purchase the components you need, and better yet – fabric wrapped light cord, sold by the foot. Tons and tons of colors. So here’s the basic plan. I need to drape the cord from the plug up to a certain point where we’ll hang a small white hook, and then back down again to bedside light height. 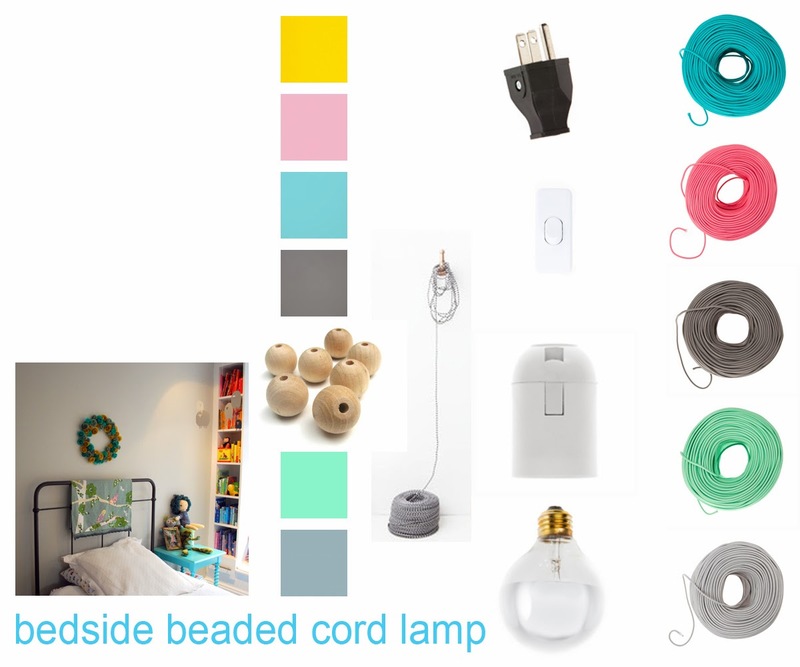 Then we’ll order the amount of cord we need, plus a plug, a cord switch (that we’ll locate along the cord where it’s easiest to control from the bed), a socket, a cool bulb with frosted tip to reduce glare. 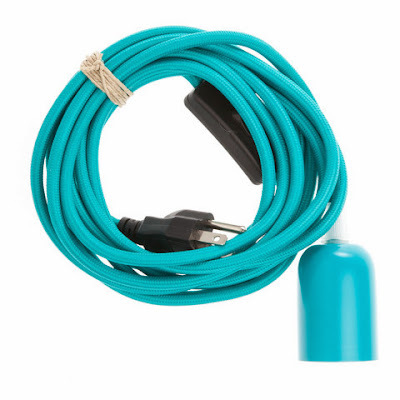 (I also will be forced to make some decisions on color for the cord – they are all so pretty.) I also need to find some oversized wooden beads, and get some glossy paint colors or spray paints for them. Assemble, test, wrap and give. Let the bedtime reading begin!